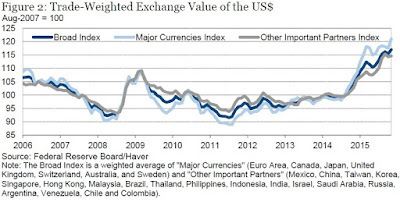 Has the Federal Reserve been manipulating the value of the US dollar downward to give US exports a boost? Are Federal Reserve policies causing swings in capital flows to and from emerging-market economies, in a way that creates financial and economic instability elsewhere in the world? Does the dominant role of the US dollar in international economic transactions provide large economic benefits to the US economy? Ben Bernanke focuses on these three questions delivered the Mundell-Fleming lecture, which he delivered at the IMF's 16th Jacques Polak Annual Research Conference on November 5, 2015, on the subject, "Federal ReservePolicy in an International Context." Video of the lecture being delivered is available, too. On the first question, concerning whether the Fed is pushing for a lower US dollar exchange rate, the answer at first glance is "no," and upon further reflection is still "no." At first glance, the value of the US dollar did fall a bit just after the Great Recession, but it has risen since then--so it's pretty much impossible to make a case that the Fed has been pursuing a cheap-dollar export-spurring policy. 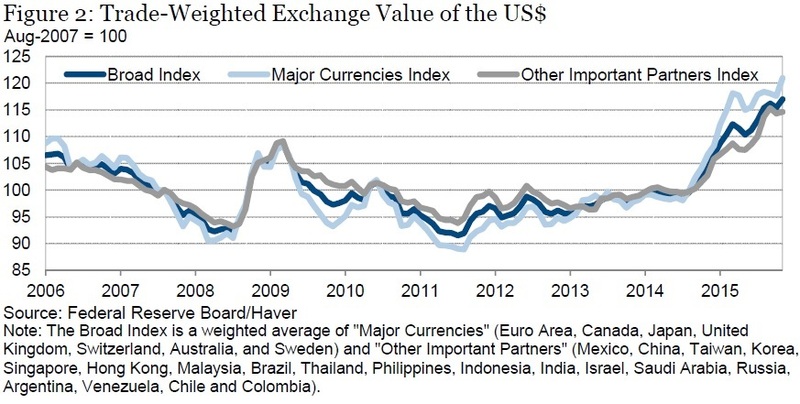 Here's a figure from Bernanke's paper showing the exchange rate of the dollar in the last decade. Whether you compare it to just major currencies, or other trading partners, or the broad index of all trading partners, the same rough pattern emerges. "Notably, although monetary easing usually leads to a weaker currency and thus greater trade competitiveness, it also tends to increase domestic incomes, which in turn raises home demand for foreign goods and services. ... In the case of the United States, ... the available evidence suggests that these two effects of monetary policy largely offset, limiting the overall effect on US trading partners." On the second issue, about whether Federal Reserve policy may cause financial swings in other countries, Bernanke offers a more cautious answer. The issue here is that with very low US interest rates in recent years, a certain amount of international investment capital has been headed into financial markets of emerging economies, pushing up stock markets and asset prices in those countries. With the Fed now starting to raise US interest rates, some of that money will now exit the emerging markets. The problem arises because financial markets in emerging markets can be quite small by global standards, so the start-stop-reverse movement of what would be a fairly modest amount of capital by the standards of the US or the EU economy can severely shake up a smaller emerging market economy. "Importantly, `improvement' in the financial sphere does not necessarily require continuous liberalization. ... [I]n somecases, macroprudential policies and even capital controls may be needed to manage credit and capital flows during the process of reform. ... Financial regulation and supervision are also the obvious tools to use against other plausible sources of spillovers, including currency mismatches in the banking system, excessive cyclicality in lending standards, and opaque and illiquid markets." Bernanke is clearly correct that Federal Reserve actions will affect other countries in a variety of ways, and that it's obviously impossible to set Fed policy in a way that would be equally satisfactory to all countries in the world. But that said, his response on this point isn't 100% persuasive. Sure, if economic policy-makers in other countries are smart, alert, and responsive, they can address these dangers of start-and-stop international capital flows. But economic policy-makers in other countries will at times be obsessed with their own domestic economy and politics, and as a result, Fed actions will sometimes bring considerable disruption. "[I]n practice it has benefited the global economy in several ways. First, ... over the past three decades or so the Federal Reserve has been successful at keeping inflation low and stable. Consequently, the dollar has served its principal function as global numeraire, namely, to maintain a stable value in terms of goods and services. "Second, there is a strong and growing global demand for safe, liquid assets, which the United States—with its political stability and deep, liquid financial markets—has been generally successful in providing. The US also maintains open trade and capital accounts, preserving international access to US assets. "Third, dollar assets have proved to be a valuable hedge for foreign holders against downside geopolitical and financial risks (Gourinchas et al., 2010; Obstfeld, 2010). Broadly speaking, US international liabilities are in the form of relatively liquid, fixed-income assets, notably government bonds and government-backed mortgage securities, whereas US international assets tend to be riskier, e.g., equities. For this reason, and because the dollar is a “safe haven” currency that tends to appreciate when global risks increase, the US net asset position improves during tranquil times but worsens during periods of stress. Gourinchas et al. (2010) calculate that about $2 trillion was transferred from the United States to other countries via valuation changes during the financial crisis. Obviously, the US role as provider of hedge assets is not the result of conscious policy. Instead, it reflects US comparative advantages in providing safe liquid liabilities and investing in riskier foreign assets, as well as the dollar’s role as a safe haven. Fourth, the Federal Reserve has shown its willingness to serve as a lender of last resort to dollar-based lenders." "The dollar’s monopoly power has also been eroded over recent decades, in that assets denominated in euros, British pounds, and yen have become increasingly viable not only as reserve currencies but for other purposes, such as posting collateral. ... [W]e shouldn’t be overly exercised over controversies about whether the dollar will retain its pre-eminence, the future of the renminbi as a reserve currency, and so on. These debates are more about symbolism than substance. In purely economic terms, the universal usage of English, say, is far more valuable to the United States than the broad use of the dollar."